Hot, molten, chocolate lava-cake is a decadent custard-sized dessert that is crusty and brownie-like on top, with a hot, melty inside. Often, these fancy cakes are elegantly garnished with powdered sugar or whipped cream or ripe raspberries. The best thing about these mini cakes is that they’re served in individual portions, which means you get to have one all to yourself. 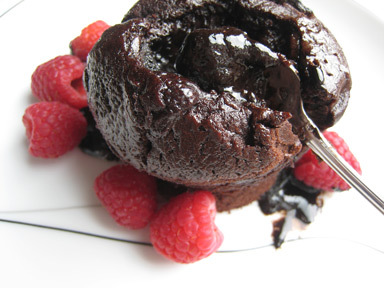 Call me strange, but I fantasize about luscious lava cake in much the same way that I fantasize about men. 1. They’re a perfectly sinful treat to be enjoyed on special occasions. 2. They’re a bit too much trouble to have every day. 3. The reason we love ’em so much is they’re not quite fully baked.